As a fabric lover it is always fun to be able to use unique and handmade fabric. Today I'm featuring a couple of projects using screen printed panels made by Lucy Engels of Skinny Malinky Quilts. 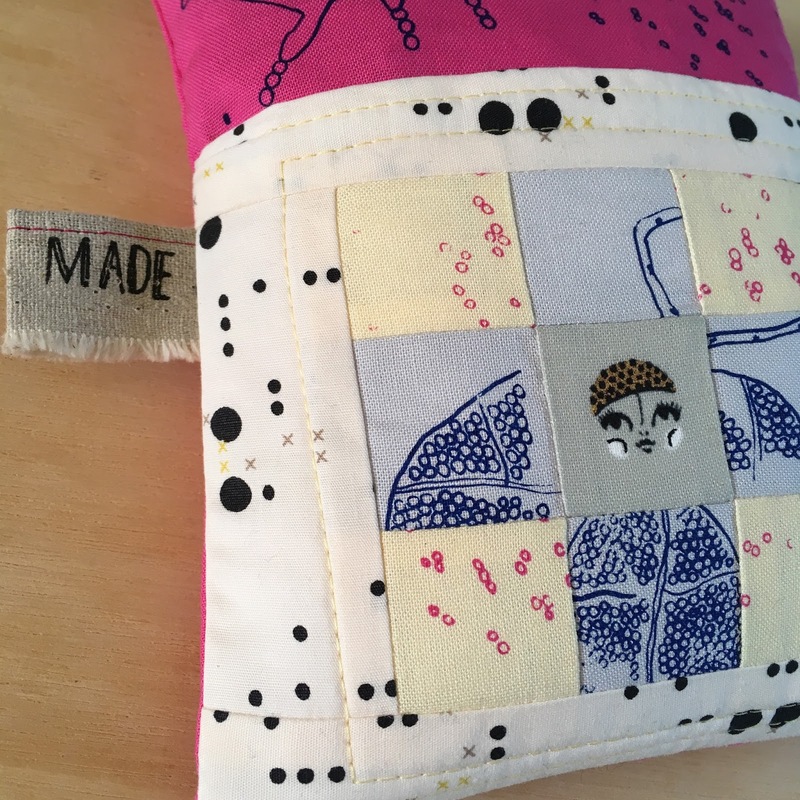 The new collection 'Actinomycetes' is a limited run, available now in her Etsy shop Skinny Malinky Quilts. 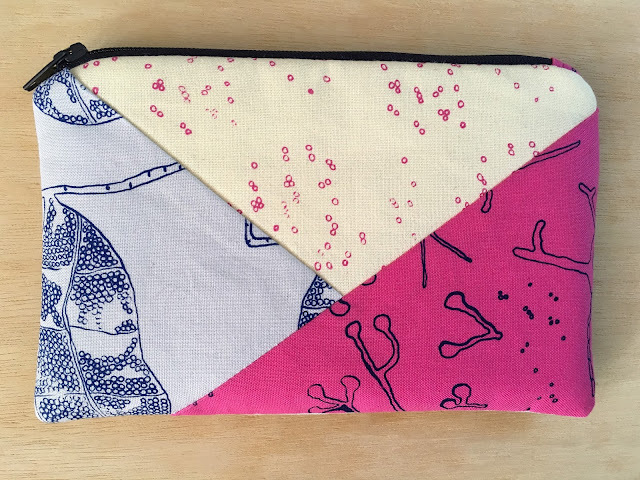 The designs are printed on Kona cotton and this mini collection is a gorgeous mix of brights and pastels. 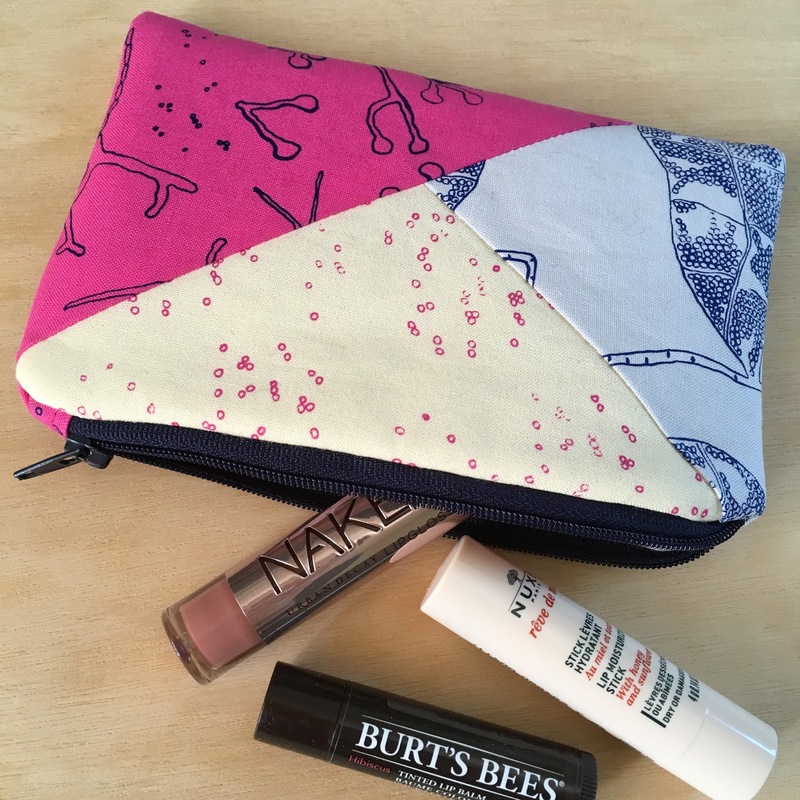 I wanted to incorporate the three prints and happened upon the perfect pattern - Sotak Handmade's free Color Block Pouch tutorial. My version came out a little smaller but it will fit nicely in my handbag. It is hard to capture the beauty of the colours, they are really vibrant! I used the Pod design on the other side. I think it's so cool and different. 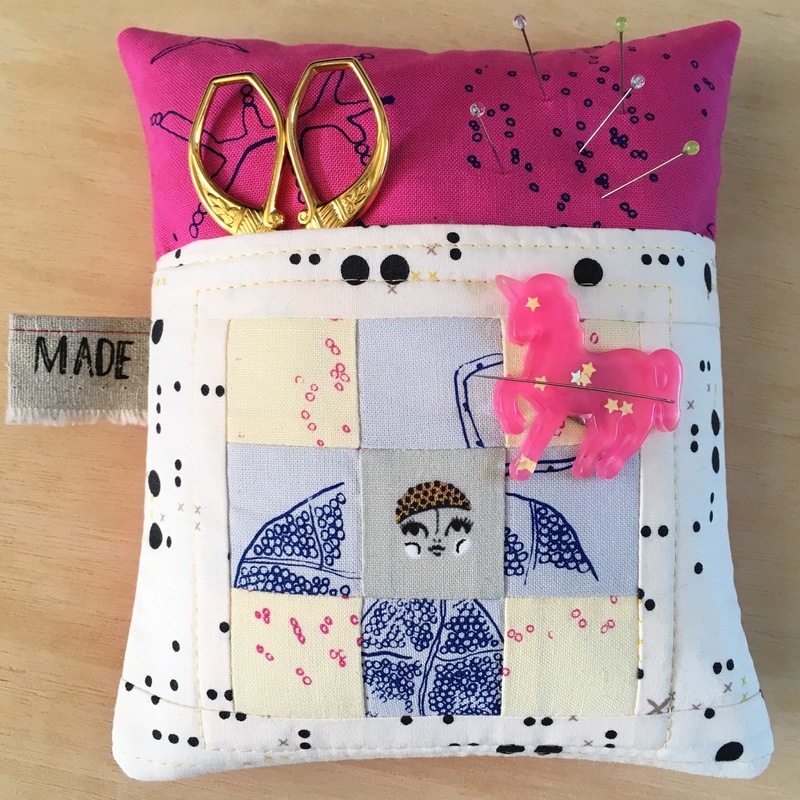 The next make has been on my 'to sew' list since I got the book 'Sew Organized for the Busy Girl' by Heidi Staples, you have probably seen the Deluxe Pincushion on social media and I get exactly why everyone has been making them! It is a fun pattern and very quick to make. 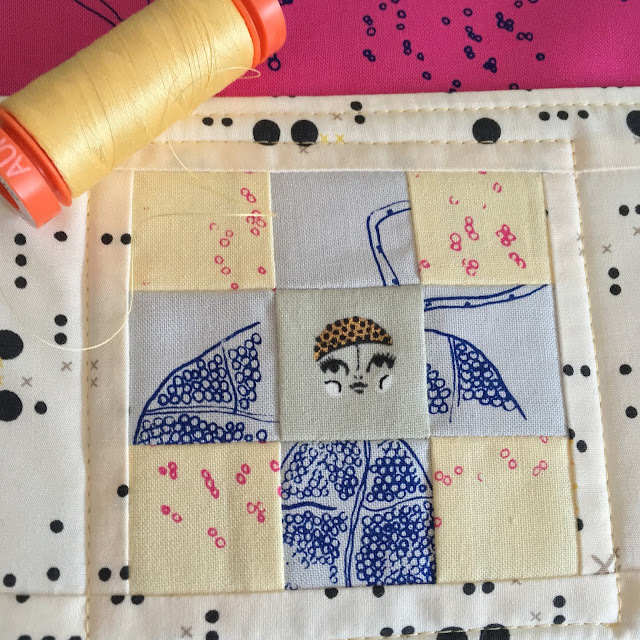 I enjoyed playing, mixing the panels with fabric from my stash. 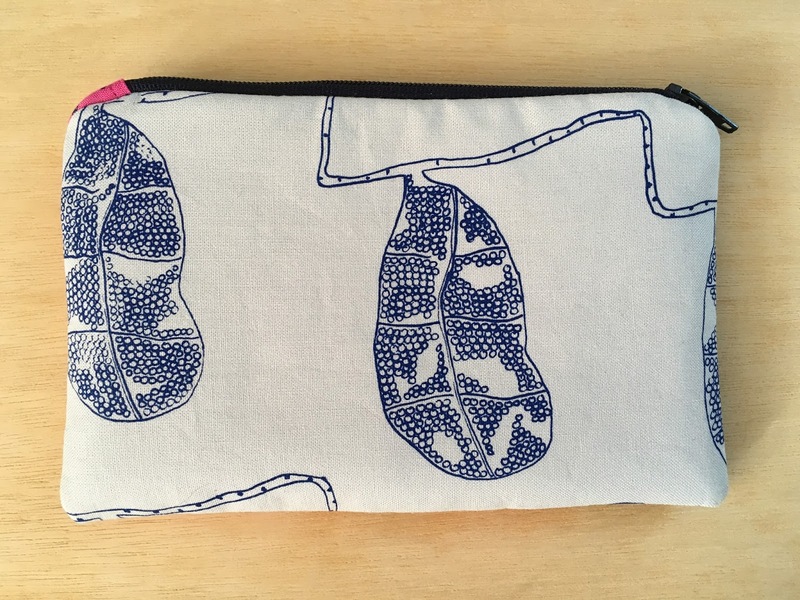 The Pod in Silver Grey and Navy and Petri Dish in Cream and Fushcia (which also look like bubbles) designs combined with a little face from Ladies Night, Black and White by Cotton + Steel and a border of NY Circuit in Ashen, Gramercy by Leah Duncan. I think she looks like an actinomycete angel, or maybe an underwater actinomycete mermaid?! I quilted the front pocket with Aurifil 50 weight #2130, I keep turning to this one it's such a pretty colour. The tag is cut from a selvedge, I hemmed the top and like that frayed bottom. I filled the pincushion with crushed walnut shells and so chose not to top stitch around the outer edges. 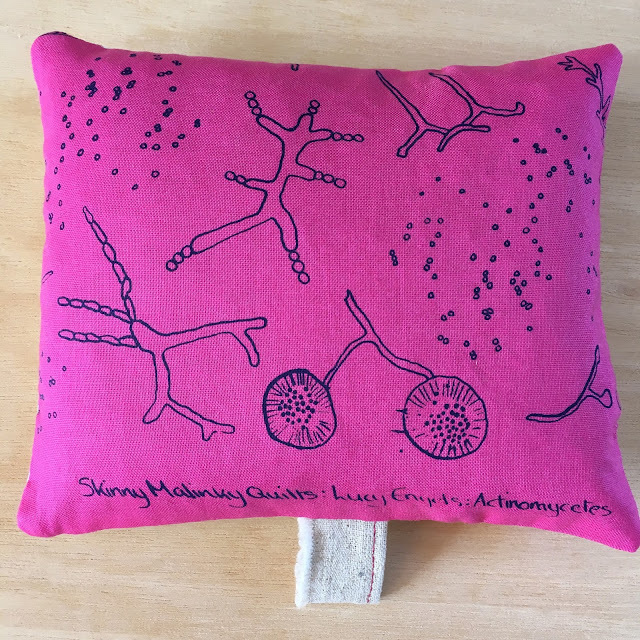 The back is Actinomycetes in Bright Pink with Navy and love the information Lucy puts on the panels, it highlights that it's handmade fabric so I kept it! If you have never heard of Actinomycetes you are not alone, I had to google it! They are basically a form of bacteria - some good, some bad. Many of the species are found in soil and rain makes the spores airborne, which means they are the reason it smells so good after it has rained (thank you @biologyconcepts). One of my favourite smells and more reason to love this fabric line. Gotta love the Sotak pattern. She writes a great pattern and your selection of fabrics was perfect. Lucy, I love the un-ordinary! THanks for sharing your "bacteria". Loving the pods print in particular. I'll be checking out skinny malinky quilts! Love the fabrics! Perfect for the makes and it's great she's localish too! Hahaha! Not at all, I like your writing. It's a brilliant collection, the quality is amazing and I love the colours! Who knew bacteria could make such cute fabric for bags? Both projects do look great and so fun! I have to start with small in between things that fill the heart with joy, too. Thanks for the inspiration.